If your mother says she loves you, check it out. Anyone with journalism training (or who knows anyone with journalism training) has heard this adage. Despite its outdated view of parenting (Should we just believe what our fathers tell us? And did only mothers say they love their children? ), verifying is a useful exercise when reviewing any best practices or research. But wait, isn’t the point of best practices and research that other people have done the hard work of figuring out what works for you? Not exactly. Best practices and research give you a starting place to explore what works in your situation. Why must content marketers question everything? You probably intuitively know the answer to this question. It’s because of the many nuances in audiences. The Content Marketing Institute audience isn’t your audience. In fact, our audience isn’t even a single audience. We have a daily blog audience, an executive publication audience, a Content Marketing World audience, a ContentTECH Summit audience, and so on and so on. The makeup and behavior of each is a bit different. The makeup and behavior of your audience is different from any segment of ours. No two audiences are alike. Does that mean research or best practices aren’t applicable? Of course not. But when you read research or guidance, check the findings against your audience before acting on it. 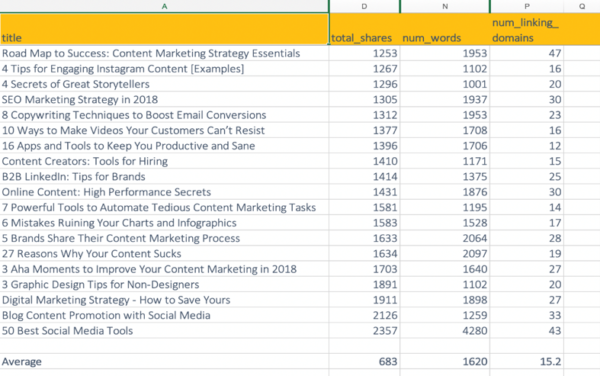 To demonstrate this practice, I dug into Backlinko’s recent exploration of how factors such as blog format and length correlate with social media shares and backlinks among 912 million posts. It’s a fascinating and worthy read that’s attracted nearly 4,000 shares and generated a great discussion in its comments. But do the findings of that enormous sample drawn from sites with both B2B and B2C audiences hold up when applied to the 260 blog posts CMI published in 2018? 94% of all blog posts generate zero backlinks. Long-form content averages 77.2% more links than short articles. Longer content outperforms short blog posts when it comes to social shares. The Backlinko research analyzed BuzzSumo data, so I headed there for CMI’s sharing and backlink totals. I set the date range of January 1, 2018 to December 31, 2018. Then I clicked Export and chose the Excel format. Once I opened the file, I found that not all the statistics included came from the blog portion of our site, so I deleted any rows that didn’t relate to blog posts. I also hid several columns that held data I wouldn’t need for this analysis. With my spreadsheet set, I dove into the comparison. Sorting by the number of referring domains, I could see at a glance that only one article earned a single backlink (and no blog posts earned zero links). I also calculated the average number of backlinks as well as social shares per post and number of words per article. You can see how I set up the sheet (and a small selection of the data) in the image below. Verdict: No CMI blog post published in 2018 failed to earn backlinks. But there was a big spread from the top link earner (179 links) to the bottom link earner (1 link). Would the next assertion from the Backlinko study explain why? The Backlinko/BuzzSumo finding that might explain this disparity is that blog posts longer than 3,000 words attract more links than shorter posts. But in reviewing CMI’s top link earner and bottom link earner, that assertion doesn’t work. The post with the most links (2019 B2B Content Marketing Research: It Pays to Put Audience First) and the post with the fewest (Data Privacy Law: Ignorance Is No Excuse) are both about 1,500 words. It’s likely the nature of these two CMI posts rather than their word count that resulted in the disparity. One is based on the original research we conduct annually. We have a process in place to distribute the findings and the industry knows to look to CMI for new stats each year. The other is a topic (data privacy) that we’ve explored much less frequently, and which didn’t arise from our research. 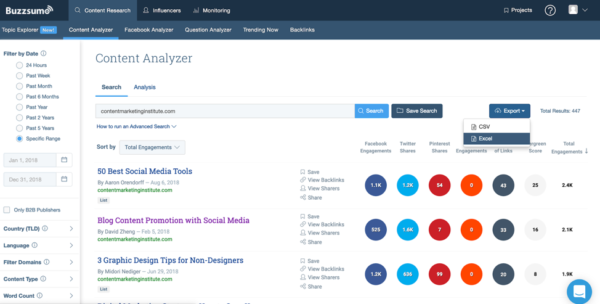 But does the Backlinko/BuzzSumo finding hold up over more posts? Of the 260 posts we published in 2018, only five were longer than 3,000 words. Those five posts attracted about 30% more backlinks than our average, but not the 77.2% difference Backlinko found. Verdict: CMI’s long-form content did earn more backlinks than shorter content. However, length doesn’t appear to be the most important factor. For example, the average length of the top 10% of link-earning articles is 1,768 words (with an average of 37 backlinks). The average length of the bottom 10% is 1,528 words (with an average of 4.7 backlinks). Did those 240 words cause this dramatic difference in backlinks? I wouldn’t bet on it. If my goal is to publish more posts to attract backlinks, I’d look at factors in addition to length to determine what changes to make to our strategy. For example, I’d look more closely at the performance of posts about original research to see whether to invest in more of those. Most of the posts CMI published in 2018 fall into this range (77%). I compared the average number of social shares per article of this length to our average number of shares per all articles published in 2018. Verdict: Blog posts between 1,000 and 2,000 words do not get the most social shares at CMI. Though there’s only a slight difference in sharing among posts of this length and our overall average number of shares, the average for articles in the 1,000 to 2,000-word length is slightly lower than our average for all posts. The average length of the 10% of posts attracting the most social shares is 1,762 words. The average length of the 10% of posts attracting the fewest social shares is 1,593. Both groups fall firmly within the length sweet spot Backlinko discovered but generated different social-sharing results. Again, further exploration is needed to discover why the bottom 10% attracted an average of 248 shares and the top 10% attracted an average of 2,357 shares. The relatively minor difference in length isn’t enough of an explanation for me. Does this mean the study was wrong? Can a study of 912 million blog posts be wrong? Probably. There are all kinds of ways data analysis can go wrong. But I’m not saying the Backlinko/BuzzSumo study is wrong. My point is simply that using research based on a data set different from your data set is a great jumping-off point. It can help you formulate questions about your content’s performance. But you can’t stop with the answers presented. You might not ask the same questions of your data that Backlinko asked of the BuzzSumo data. Your subset of the overall data set might return the same or dramatically different conclusions. 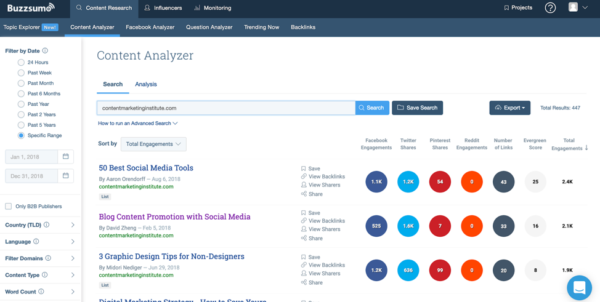 You might include data that BuzzSumo doesn’t include (LinkedIn shares, for example). It comes down to this: No matter who tells you what works in content marketing (even if it’s CMI!) make sure you test and measure the advice against your audience. In other words, check it out. How are you using data to analyze your content marketing performance? Get more advice, tips, and insight to verify for your content marketing program. Subscribe to the free weekday CMI newsletter.